South Africa is one of the most geographically varied countries of the African continent, comprising territory that ranges from the rolling, wide open savanna of the Eastern Transvaal to the Kalahari Desert and the peaks of the Drakensberg Mountains. South Africa is a middle-income, emerging market with an abundant supply of natural resources; well-developed financial, legal, communications, energy, and transport sectors; a stock exchange that ranks among the 10 largest in the world; and a modern infrastructure supporting an efficient distribution of goods to major urban centers throughout the region. After the British seized the Cape of Good Hope area in 1806, many of the Dutch settlers (the Boers) trekked north to found their own republics. The discovery of diamonds (1867) and gold (1886) spurred wealth and immigration and intensified the subjugation of the native inhabitants. The Boers resisted British encroachments but were defeated in the Boer War (1899-1902). The resulting Union of South Africa operated under a policy of apartheid – the separate development of the races. The 1990s brought an end to apartheid politically and ushered in black majority rule. South Africa is the economic engine of Africa, generating a quarter of the continent’s entire Gross Domestic Product (GDP). The country’s strong and diverse economy produces over half of Africa’s electricity, 45 percent of its minerals and 40 percent of its industrial output. South Africa has built a solid physical and economic infrastructure. The country is blessed with rich mineral and metal resources, and has growing manufacturing and service sectors and a booming tourism market. The Johannesburg Stock Exchange is the 18th largest in the world by market capitalization, which was around R3.3 trillion in late 2005, and South African banking sector is rated in the top 10 globally. Economic growth has averaged 3.5 percent a year since late 1999, achieving the longest period of expansion in the country’s history. South Africa’s Rand currency has stabilised at around six to the dollar. Consumer inflation is less than five percent, and the budget deficit is half its five percent level in 1994. Economic growth has begun to deliver more jobs – an extra one million in 2004 and 2005, according to Statistics South Africa’s General household Survey. More efficient tax collection has enabled tax cuts while dramatically raising government revenue, enabling increases in spending on social services and development. South Africa is located at the southern most region of Africa, with a long coastline that stretches more than 2500 kilometers and across two oceans (the Atlantic and the Indian). Contrary to popular global belief, South Africa has a generally temperate climate, due in part to it being surrounded by the Atlantic and Indian Oceans on three sides. Due to this varied topography and oceanic influence, a great variety of climatic zones exists. The climatic zones vary, from the extreme desert of the southern Namib in the farthest northwest to the lush subtropical climate in the east along the border with Mozambique and the Indian Ocean. From the east, the land quickly rises over a mountainous escarpment towards the interior plateau known as the Highveld. It may be argued that there is no “single” culture in South Africa because of its ethnic diversity. Today, the diversity in foods from many cultures is enjoyed by all and especially marketed to tourists who wish to sample the large variety of South African cuisine. In addition to food, music and dance feature prominently. The country’s black majority still has a substantial number of rural inhabitants who lead largely impoverished lives. It is among these people, however, that cultural traditions survive most strongly; as blacks have become increasingly urbanized and westernized, aspects of traditional culture have declined. The middle class lifestyle, predominantly of the white minority but with growing numbers of black, colored and Indian people, is similar in many respects to that of people found in Western Europe, North America and Australasia. Members of the middle class often study and work abroad for greater exposure to the world’s markets. Asians, predominantly of Indian origin, preserve their own cultural heritage, languages and religious beliefs, being Christian, Hindu or Sunni Muslim and speaking English, with Indian languages being spoken less frequently. Most Indians live lifestyles similar to that of whites. School life spans 13 years – or grades – although the first year of education, grade 0 or “reception year”, and the last three years, grade 10, 11 and grade 12 or “matric” are not compulsory. Many Primary schools offer grade 0, although this pre-school year may also be completed at Nursery school. For university entrance, a matric “endorsement” is required, although some universities do set their own additional academic requirements. Eleven universities: eight of the old universities and three new ones created through mergers between universities. These are ‘traditional’ universities that offer bachelor degrees, with strong research capacity and high numbers of postgraduate students. Six universities of technology: two of the old technikons and three new institutions born out of mergers between technikons. These vocationally oriented institutions award higher certificates, diplomas and degrees in technology, and have some postgraduate and research capacity. Six comprehensive universities: two of the old universities and four established out of mergers between universities and technikons. These are a new kind of institution, offering both bachelor and technology qualifications, and focusing on teaching but also conducting research and postgraduate study. 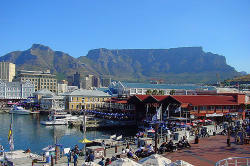 South Africa is one of the world’s most exiting places to be a student. It is a country at the cutting edge of change, where high-tech solutions, based on in-depth research, are being developed in response to some of the world’s most pressing problems and challenges. South Africa uses English as the primary language of instruction, charges lower fees than developed nations, has a lower cost of living, and has a large higher education sector that is accessible and offers internationally recognized qualifications. The number of foreign students in South Africa has soared from 12,600 in 1994 to some 52,000 today, or seven percent of a total higher education student population of 730,000 students, according to statistics compiled by the Department of Education. In sheer numbers, most international students tend, unsurprisingly, to be clustered in South Africa’s big institutions, such as North-West University (39,000 students), the University of KwaZulu-Natal (41,000), the University of Pretoria (46,000) and Tshwane University of Technology (58,000). The University of Cape Town is an exception, with the highest actual number of foreign students at a ‘contact’ institution despite having only 22,000 students. Perhaps more importantly in terms of the international ‘culture’ of a university and its accessibility to non-South African students, is the proportion of foreign to local students. Rhodes University has the highest proportion, with one in four (26.5 percent) of its students from outside South Africa, followed by the University of Cape Town (22.4 percent). More than one in 10 students are international at the Universities of Fort Hare and the Western Cape, while international students comprise over eight percent of the student body at the universities of the Witwatersrand, Nelson Mandela Metropolitan and KwaZulu-Natal.